A Torch In His Heart (The Wanderer Book 1) by Anna Belfrage is a story filled with romance and magic. From the moment Helle Madsen walks into Woolf and Partners and meets its intense owner, Sam Woolf, she decides he’s an unsettling man. There is something dark and dangerous about him that Helle can’t quite put her finger on. All she knows is that her heart beats faster and she has a strong desire to flee. When her fears prove correct, she finds a savior in Jason Morris. Though she’s never met Jason before, except in her dreams, everything about him seems familiar. Helle discovers that she knew both Jason and Sam in a previous life. Bound together through countless lives, Helle must choose the right man and end the cycle of heartbreak and pain that began three thousand years ago. A Torch In His Heart is aptly named as it describes an undying love that transcends time. From the moment I started reading this book the plot pulled me in and wouldn’t let go. In a story filled with paranormal phenomena, the characters are magical and larger than life. Anna Belfrage writes amazing characters that you can’t help but fall in love with. I liked the unpredictability of story events while tackling reincarnation. The backstory was told in a way that enriched the story and brought depth to the characters. Paranormal romance readers who like meatier stories will not regret buying this book. A Torch In His Heart ends on a cliff-hanger. To continue reading Helle’s story, readers will have to grab Smoke In Her Eyes. A Torch in His Heart is the first installment of Anna Belfrage's The Wanderer series. In the beginning, readers are introduced to the handsome, charismatic and Patrick Bateman-like character that is Sam Woolf. Helle Madsen is working for him; she only aimed to work for him for six months, but he had other plans. Helle finds herself stuck under Sam's evil thumb. Luckily the literal man of her dreams, Jason Morris, comes to her rescue just in time, but their story doesn't end there, in fact, it doesn't even begin there. Helle, Jason, and Sam go back about three thousand years. How is that possible? Reincarnation. It seems that their lives are forever tied together by fate, always ending in death, but will history repeat itself? A Torch in His Heart is a novel targeted for a more mature audience, and there are quite a few adult themes throughout it. With that said, Anna Belfrage did a fantastic job of executing the more adult scenes in her novel. The way Belfrage built suspense was both nerve-wracking and tantalizing. I was compelled by the extraordinary romance she created and what's more is that despite Sam Woolf being the obvious villain, Belfrage gave Sam enough appeal for him to be a character who has complexities. Jason, on the other hand, is your archetypal hero. He was easy to fall for and easy to connect with. As for Helle, I seldom read romance novels where the leading lady has a great relationship with other women. I truly appreciated how close she was to her mother and her friend, Alison. A Torch in His Heart is a book I'd recommend to anyone looking for a more mature take on fantasy and romance. 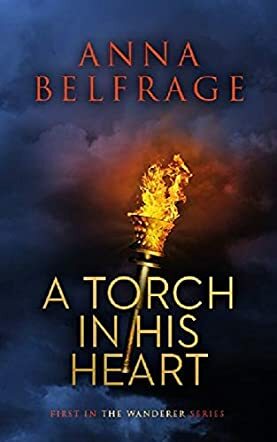 A Torch in His Heart is a suspenseful romantic novel by author Anna Belfrage, and the debut novel of The Wanderer series. Based on the concept of an endless cycle of reincarnation, the trio of central characters in the novel is a woman, and the two men who have fought over her since ancient times. In the modern day, Helle Madsen is the new embodiment of that woman, working for the gorgeous but hard-nosed Sam Woolf in the bustling city of London. When a mysterious stranger, Jason Morris, shows up and seems to have it in for Sam, a spiral of emotions threatens to bring the trio back to the same tragic conclusion which has haunted them for eons. I really enjoyed the concept of A Torch in His Heart. Setting it up as a doomed romance from the start really gets you invested in the fate of the characters to see if they change the pattern history has set for them. Fans of steamy romance will not be disappointed by the sexual scenes, and Helle Madsen is a perfectly likeable heroine with just the right balance between her sassy front and her vulnerable side. Sam and Jason are both well defined and well described as strong male leads, and as a Britisher myself I really appreciated the authenticity of the London setting of the tale. Overall, I’d recommend Anna Belfrage as an author who crafts a beautiful scene and knows how to balance a plot. A Torch in His Heart never has a dull moment, and will please romance fans everywhere.